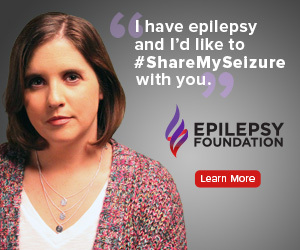 #ShareMySeizure is an education and awareness initiative conducted cooperatively between the Epilepsy Foundation and the Centers for Disease Control and Prevention (CDC). Our media partner in this campaign is the CBS Community Partnership Division. The initiative seeks to improve public recognition of seizures, understanding about epilepsy, and knowledge about proper seizure first aid. Additionally, the initiative encourages people living with seizures to seek out the best specialty treatment available for optimal control and quality of life. In November 2017, the messaging will continue with digital/social media placement nationwide and CBS television spots in Chicago and Philadelphia. Watch the videos and learn how to get involved here.